All the meat we sell comes from animals that have been reared at Horlands farm. If you would like to know more about our production process please follow this Sheep link..
Fresh Meat – Never previously frozen. All our meat is professionally butchered locally and is sold in packs that are kept chilled and never previously frozen. 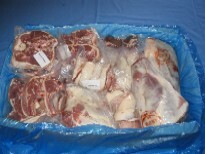 Each piece of meat is vacuum packed ready for your freezer or for cooking straight away! As our animals eat a natural grass based diet they grow slowly, enhancing their flavour. Due to this the meat is only available at certain times of the year when the animals become mature. Lamb is available in November and February. Beef is available in November, and March. Once ordered, we will contact you by telephone, as to a time and date when your meat will be ready for collection. though the Contact Us link.